The marine pelagic realm occupies 70% of the planetary surface and plays a fundamental role in modulating the global environment via climate regulation and biogeochemical cycling (Legendre and Rivkin, 2002). Perhaps equally important to global climate change, in terms of modifying the biology of the oceans, is the impact of anthropogenic CO2 on the pH of the oceans, which will affect the process of calcification for some marine organisms (Feely et al., 2004), but effects of this are as yet undocumented. Other driving forces of change that are operative in marine and freshwater biological systems are over-fishing and pollution from terrestrial runoff (from deforestation, agriculture and urban development) and atmospheric deposition, and human introduction of non-native species. Observational changes in marine and freshwater environments associated with climate change should be considered against the background of natural variation on a variety of spatial and temporal scales. While many of the biological responses have been associated with rising temperatures, distinguishing the effects of climate change embedded in natural modes of variability such as ENSO and the NAO is challenging. Concerns about the impacts of climate change on coral reefs centre on the effects of the recent trends in increasing acidity (via increasing CO2), storm intensity and sea surface temperatures (see Bindoff et al., 2007, Section 5.4.2.3; Trenberth et al., 2007, Sections 3.8.3 and 3.2.2). Decreasing pH (see Chapter 4, Box 4.4) leads to a decreased aragonite saturation state, one of the main physicochemical determinants of coral calcification (Kleypas et al., 1999). Although laboratory experiments have demonstrated a link between aragonite saturation state and coral growth (Langdon et al., 2000; Ohde and Hossain, 2004), there are currently no data relating altered coral growth in situ to increasing acidity. There is now extensive evidence of a link between coral bleaching - a whitening of corals as a result of the expulsion of symbiotic zooxanthellae (see Chapter 6, Box 6.1) - and sea surface temperature anomalies (McWilliams et al., 2005). Bleaching usually occurs when temperatures exceed a 'threshold' of about 0.8-1°C above mean summer maximum levels for at least 4 weeks (Hoegh-Guldberg, 1999). Regional-scale bleaching events have increased in frequency since the 1980s (Hoegh-Guldberg, 1999). In 1998, the largest bleaching event to date is estimated to have killed 16% of the world's corals, primarily in the western Pacific and the Indian Ocean (Wilkinson, 2004). On many reefs, this mortality has led to a loss of structural complexity and shifts in reef fish species composition (Bellwood et al., 2006; Garpe et al., 2006; Graham et al., 2006). Corals that recover from bleaching suffer temporary reductions in growth and reproductive capacity (Mendes and Woodley, 2002), while the recovery of reefs following mortality tends to be dominated by fast-growing and bleaching-resistant coral genera (Arthur et al., 2005). While there is increasing evidence for climate change impacts on coral reefs, disentangling the impacts of climate-related stresses from other stresses (e.g., over-fishing and pollution; Hughes et al., 2003b) is difficult. In addition, inter-decadal variation in pH (Pelejero et al., 2005), storm activity (Goldenberg et al., 2001) and sea surface temperatures (Mestas-Nunez and Miller, 2006) linked, for example, to the El Niño-Southern Oscillation and Pacific Decadal Oscillation, make it more complicated to discern the effect of anthropogenic climate change from natural modes of variability (Section 1.3.4). An analysis of bleaching in the Caribbean indicates that 70% of the variance in geographic extent of bleaching between 1983 and 2000 could be attributed to variation in ENSO and atmospheric dust (Gill et al., 2006). There is an accumulating body of evidence to suggest that many marine ecosystems, including managed fisheries, are responding to changes in regional climate caused predominately by warming of air and sea surface temperatures (SSTs) and to a lesser extent by modification of precipitation regimes and wind patterns (Table 1.5). The biological manifestations of rising SSTs have included biogeographical, phenological, physiological and species abundance changes. 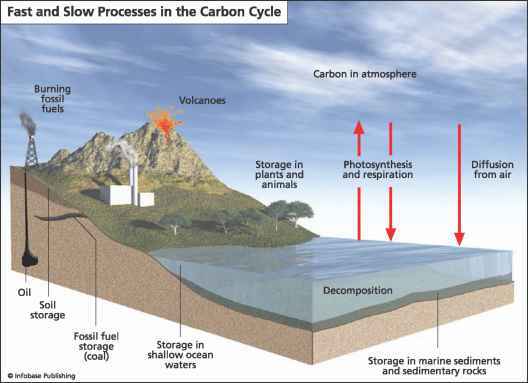 The evidence collected and modelled to date indicates that rising CO2 has led to chemical changes in the ocean, which in turn have led to the oceans becoming more acidic (Royal Society, 2005). Blended satellite//« situ ocean chlorophyll records indicate that global ocean annual primary production has declined by more than 6% since the early 1980s (Gregg et al., 2003), whereas chlorophyll in the North-east Atlantic has increased since the mid-1980s (Raitsos et al., 2005). Table 1.5. Examples of changes in marine ecosystems and managed fisheries.